On Thursday evening at Gulfstream Park, trainer Chad Brown and jockey Irad Ortiz, Jr. were crowned the 2018 Eclipse Award winners in their respective categories. On Saturday, the pair teamed up to take down the inaugural running of the $7 million Pegasus World Cup Turf Invitational with the lightly-raced Bricks and Mortar for owners Seth Klarman and William Lawrence. A 5-year-old son of Giant's Causeway, Bricks and Mortar was making just his second start off a 14-month layoff, but the intact horse pulled away to a convincing 2 1/2-length win as the second choice at odds of 5-2. Racing over the rain-soaked “yielding” turf course, Bricks and Mortar covered 1 3/16 miles in 1:54.59. The Irish invader Magic Wand made up ground along the inside to finish second at 9-1, while royally-bred Delta Prince ran well to finish third, also at 9-1. Catapult ran fourth at 6-1, while the 2-1 favorite Yoshida finished off the board. Bricks and Mortar was sharp enough out of the starting gate, and in fact was just behind the first flight of horses heading into the clubhouse turn. Up front, the speedy mare Fahan Mura took command over Dubby Dubbie and Aerolithe through a first quarter in :22.94. Ortiz eased Bricks and Mortar back to fifth, and was able to keep the horse calm when several jockeys launched mid-race bids. The most visible was Catapult, winging around the outside from sixth to take the lead and mark the half-mile in :47.93, about three-quarters of a length ahead of Fahan Mura. Magic Wand and Delta Prince also started to make their moves, splitting around the patiently waiting Bricks and Mortar. Next Shares also passed Bricks and Mortar on the inside, but Ortiz never panicked and waited as long as he could. When Channel Maker moved up alongside Bricks and Mortar in near-last position, Ortiz let his mount keep pace and wound up three-wide as the field make the turn for home. Suddenly Ortiz and Bricks and Mortar were up into fourth position, chasing Catapult into the lane. Delta Prince took over from Catapult in the stretch, but Bricks and Mortar was coming like a freight train and easily overwhelmed that rival. Ortiz pumped his fist as he crossed under the wire first with Bricks and Mortar, winning by 2 1/2 lengths. “I got a perfect trip,” said Ortiz, Jr. “My horse put me in a good position and just held it together, saving ground. When I got kicked him out, he exploded. Magic Wand had continuing making up ground along the inside and was game late to nose out Delta Prince for second, while Catapult was able to hold fourth position. It was tight for fifth between Channel Maker and Yoshida, but Channel Maker won the photo. Next Shares, Dubby Dubbie, Aerolithe, and Fahan Mura completed the order of finish. Bred in Kentucky by George Strawbridge, Jr., Bricks and Mortar was a $200,000 yearling at the Keeneland September sale. He debuted in February of his sophomore season and won at first asking to kick off a four-race win streak, including the G2 National Museum of Racing and Hall of Fame Stakes. He then ran third twice in the G3 Saranac and G3 Hill Prince before he was given 14 months away from the races. Returning to the starting gate in December of 2018, Bricks and Mortar got up late to win a one-mile allowance race at Gulfstream Park. Overall, the horse has won six of his eight starts to earn approximately $3 million. 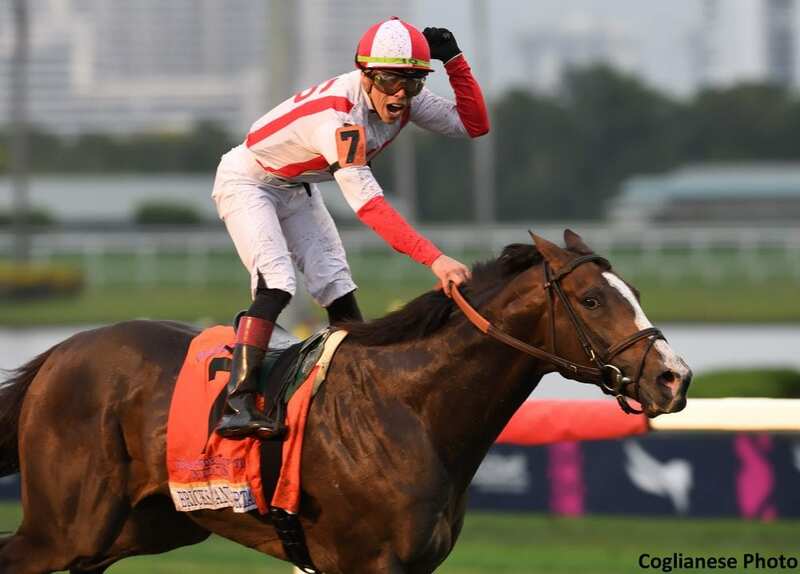 This entry was posted in NL Article, Pegasus World Cup and tagged bricks and mortar, Chad Brown, giant's causeway, Gulfstream, gulfstream park, Irad Ortiz, pegasus world cup, pegasus world cup turf, Seth Klarman, turf, william lawrence by Paulick Report Staff. Bookmark the permalink.